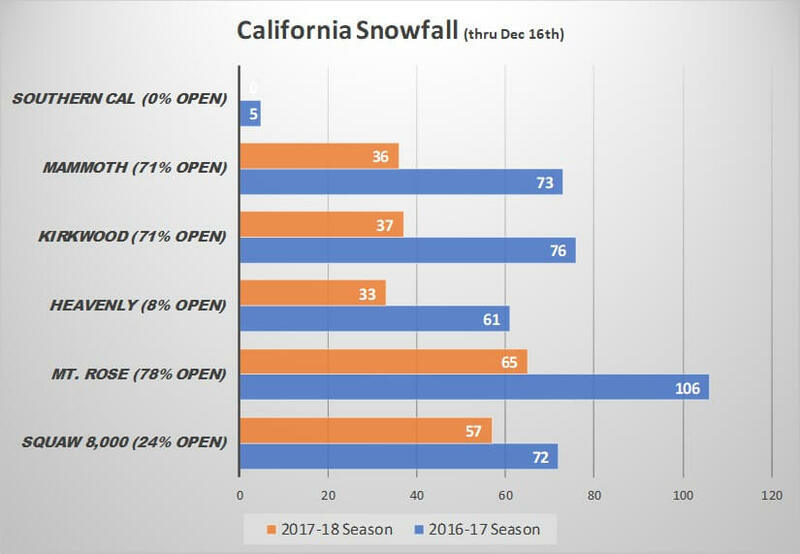 How Does 2017-2018 Season Snowfall Compare to 2016-17? 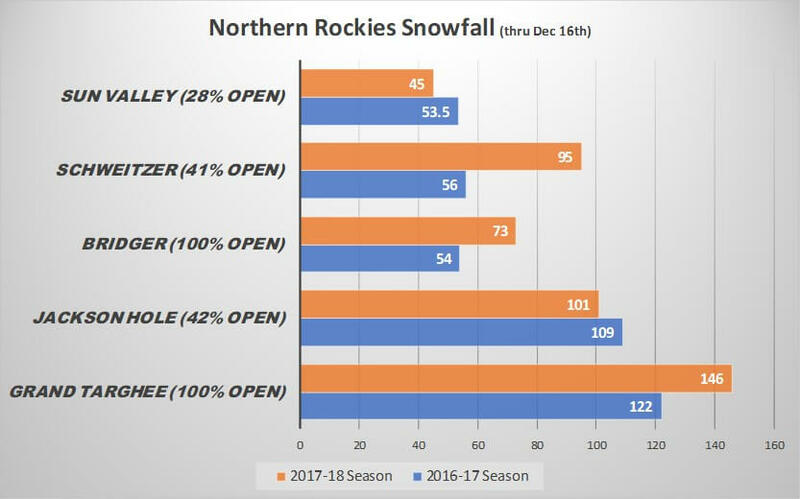 How Does the 2017-2018 Season Snowfall Compare to date? 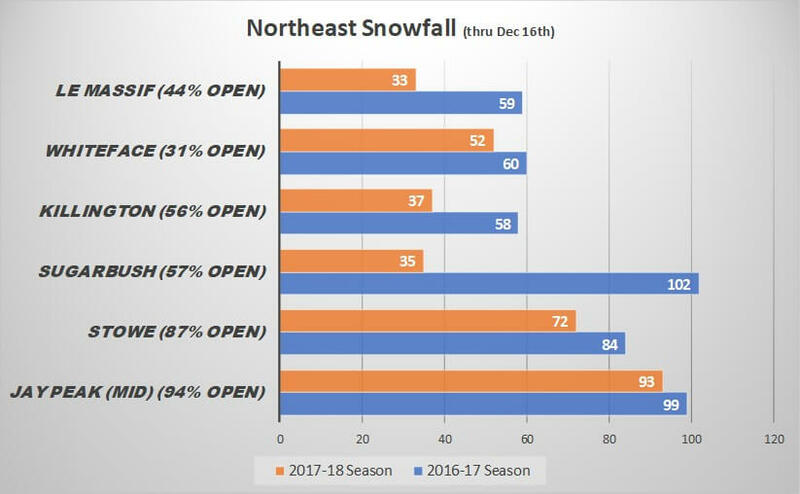 While riding the chairlifts, there’s been a lot of talk that “last winter started this slow” while others say “we were in waist deep pow.” Who’s right? Instead of trying to remember all the details, why not look at some historical data? 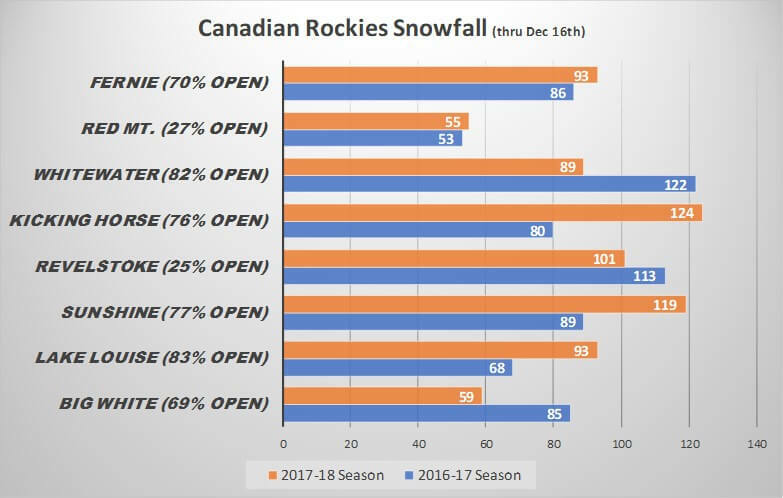 Of course, any data you get mid-season isn’t going to be perfect but at least it gives us an idea of where we’re at. To start things off… no matter where you live, let’s pray for snow! Huge thanks to Tony Crocker for allowing us to use his information. Curious about past seasons? Be sure to check out his website – Bestsnow.net. One word for last season in the Sierra Nevadas: Epic. As you can tell, we started slow but not as slow as this winter. With the high-pressure ridge retro-grading towards Alaska, there’s a small chance for storms at the end of the month. Let’s hope this comes to fruition. 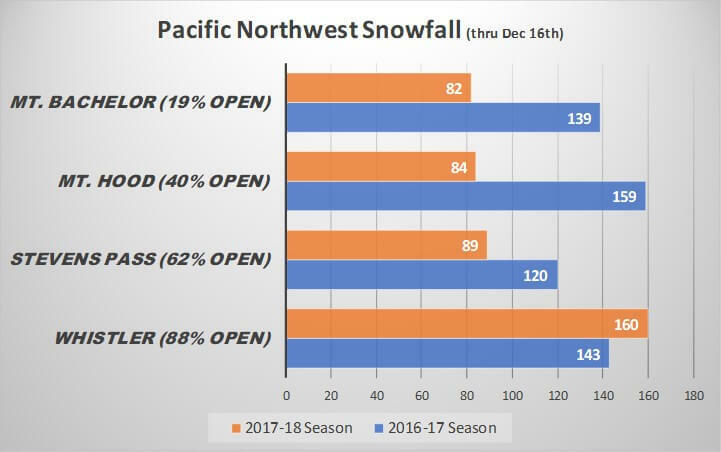 The PNW is typically the part of the country that gets more consistent storms, and the numbers for this season prove that’s true. In fact, they’re doing pretty well. With a few more storms predicted this week, they’ll continue to add to their season totals. Winner! Winner! Chicken Dinner! This region is the clear winner this early season. Way above normal and a weak La Nina forecast, it looks like they’ll continue to keep stacking the white stuff. If you’re planning a trip in early January, this is definitely where you want to go. If you don’t feel like heading to Canada then Grand Targhee is a great choice. 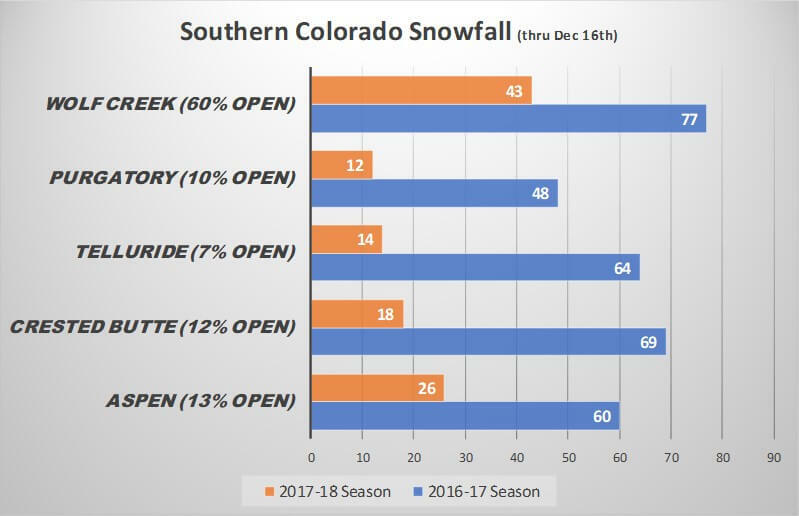 With 100% of their terrain open since Thanksgiving and more snow in the forecast, they’re going to continue to have great conditions. 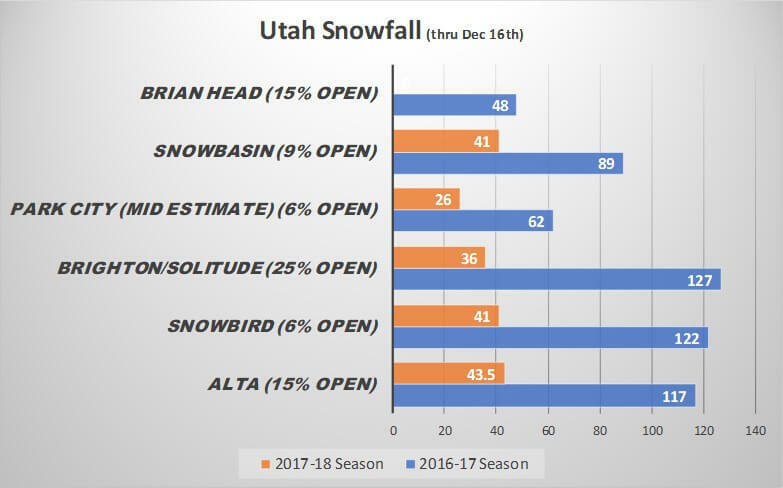 Typically the Wasatch are a perennial favorite in late December/early January but they’re on track for the second worst start in over 50 years. Most of the terrain that is open is on snowmaking. If you do have a trip booked, be sure to check out our article on the largest snowmaking systems. A-Basin and Loveland started out super well with snowmaking but old man winter hasn’t really showed up just yet. On top of that, they’ve had unseasonably warm weather meaning that if you do visit over the holidays, be patient and have fun, even if you experience some rush-hour traffic style runs on snow-made trails. One word: OUCH! Out of all the areas in North America, this is the one experiencing the driest conditions. 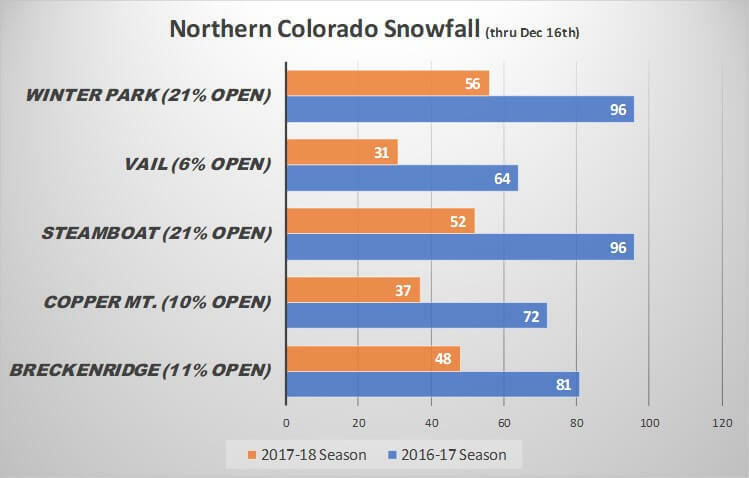 Even Wolf Creek, who normally is a good option for early season, has received only 41 inches of snow. Let’s hope this dry spell breaks soon. Home to massive snowmaking, it’s less about natural snowfall to open terrain and more about cold weather. With a few cold snaps and the lake effect kicking in a couple times, they’re doing pretty good this early. With more snow expected and cold weather to continue, they’ll be setting up for some decent holiday skiing. If you already booked a vacation to a dry region listed above, we hope that you don’t cancel it. As we’ve talked about in past articles, these mountain towns need your support to keep the small businesses up and running. You aren’t there just to ski but also to help the community and have fun while off the slopes too. Above all else… pray for snow and have a beer! The snow will come and when it does we’ll all be ready.